How Do You Find the Domain and Range of the Inverse of a Relation? Finding the domain and range of the inverse of a relation can be tricky, unless you know the correct steps! This tutorial shows you the steps needed to find the domain and range of the inverse of a relation. Check it out! 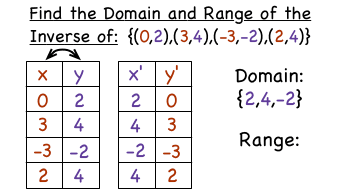 How Do You Find the Domain and Range of a Relation? Finding the domain and range of a relation? No problem! Watch this tutorial and learn how to find the domain and range of a relation.